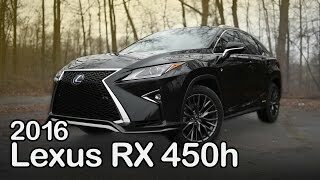 After creating records through its Lexus RX models, Lexus looks all set to rumble the streets with its exciting two new models; Lexus RX 350 and our car of today Lexus RX 450h F Sport 2016. Equipped with Lexus safety system the model has been designed to deliver performance and comfort. 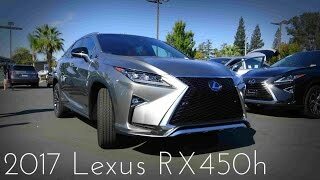 Let us have a look at the review of Lexus RX 450h F Sport 2016 to know more about this hybrid model. The interior of Lexus RX 450h F Sport 2016 as we mentioned earlier in this review, is impeccable with its design and comfort. The interior trim includes series of option that includes Matte Bamboo, Espresso Walnut (my favorites) and more like the Striated Black Trim or Gray Sapele Wood with aluminum that looks luxurious. It’s not just the design but you’ll be having enough of space inside for five passengers while the low floor gives you sufficient leg room as well. Talking about technology you’ll be having touch free power rear door, this allows you to open the rear hatch by simply bringing your hand close to the Lexus emblem. Apart from this making the interior of Lexus RX 450h F Sport 2016 remarkable are the usability switches and cup holders and storage room in center console. The Lexus Human Machine Interface, Heads-Up display and instrument cluster combine together to make the interior look and feel gorgeous. The exterior of Lexus RX 450h F Sport 2016 is as gorgeous as its interior. Starting with the front fascia the same iconic massive spindle grille makes it house amidst the elongated headlights. Both the headlights feature 18 individual LEDs that work as turn indicators. Moving towards the rear end the first thing you might notice are the L-shaped taillights that wrap over the tailgate and the rear fender section. Remarkable is the floating roof effect through blacked-out C-Pillars. 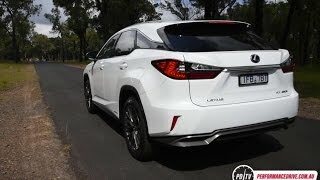 Apart from these few more features like the scratch resistant self-restoring coat that is over all the models will keep the exterior of Lexus RX 450h F Sport 2016 always the way it was the first day. The entire body rolls of 20” wheels. 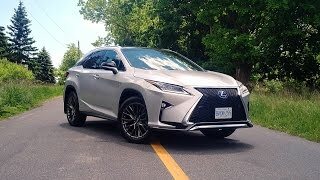 Rolling the wheels of Lexus RX 450h F Sport 2016 is a 3.5 liter direct-injected V6 engine cranking total output of 308 hp and peak torque of 335 nm paired to eight-speed automatic transmission. The top speed and other performance figures of Lexus RX 450h F Sport 2016 are not yet revealed, we promise to share them as soon as we find a rolling model over the test tracks.